The total turnout of 90.5% and approval by 78.6% are extraordinarily high by U.S. standards. But given the Cuban government’s control of the media on the island and the overwhelming message calling for the YES vote, it is amazing that the total negative vote was 21.4% (NO + Blank & Spoiled Ballots+Not Voting). The new constitution recognizes private and cooperative businesses, creates the posts of prime minister and provincial governor and introduces presumption of innocence and habeas corpus into the justice system. Cuba Arrests Opponents of Proposed New Constitution, dwkcommentaries.com (Feb. 14, 2019); Cuba Says YES to new Constitution, Granma (Feb. 25, 2019);Special Coverage: The Cuban people vote in Constitutional Referendum, Granma (Feb. 24, 2019); Whitefield, Cuba approves new constitution amid unprecedented opposition, Miami Herald Feb. 25, 2019). The Cuban government has made plans to celebrate Pope Francis’ visit to Cuba, September 19-22. The government also has taken conflicting actions regarding prisoners. On September 11 the Cuban government announced that it would release 3,522 prisoners. Two days later, on September 13, it detained about 50 predominantly Roman Catholic citizens whom the government regards as dissidents. “In 2011, the Cuban Interfaith Platform, which includes representatives of all religious manifestations, was created. Undoubtedly, of special significance was its struggle for the return of the Cuban Five imprisoned in the United States, and in establishing a bridge between them and their families. The Council of Churches of Cuba was also a leading protagonist in the return home of Elián González and in confronting the blockade, another of the battles of our people for justice. “Pope Francis will encounter these and other realities . . . [in Cuba. We] will welcome him on behalf of all Cuba. Among the gathered there may be those who don’t share the same religious beliefs, even those who are there motivated simply by that feeling of warmth and hospitality so inherent to Cubans. On September 11 the government announced that it would release 3,522 prisoners, including women, inmates younger than 20 with no prior offenses, those older than 60, prisoners with illnesses, some foreigners whose countries have agreed to repatriate them and others whose terms are coming to an end. Excluded from the release will be those charged with serious crimes like murder or child sexual abuse or crimes against national security. “It’s a gift to Pope Francis— a grand gesture,” said Elizardo Sánchez, president of the Cuban Commission for Human Rights and National Reconciliation, a group that tracks rights in Cuba. Sebastián A. Arcos, a former political prisoner in Cuba and now the associate director of the Cuban Research Institute at Florida International University in Miami, said the mass release on the cusp of the Pope’s visit was a cynical and opportunistic effort to demonstrate a more tolerant government. “It’s makeup,” he said. On Sunday, September 13, Cuban police detained about 50 people when a predominantly Roman Catholic dissident group led a march in Havana. In their weekly rally following mass at Havana’s Santa Rita Catholic Church, about 40 of the women, accompanied by about a dozen male supporters, marched outside their authorized route and down a side street where they were set upon by some 200 government supporters and police. Female police pushed, pulled and carried the women onto buses as some sat down in an attempt to resist. The men were handcuffed and shoved into police cars and vans. Such detentions have become common following regular Sunday marches by the Ladies in White, a group that has criticized the Roman Catholic Church and Cuban Cardinal Jaime Ortega for failing to advocate on its behalf with the Cuban government. Ladies in White leader Berta Soler told Reuters the women planned to attend masses that Pope Francis will lead in Havana and Holguin while in Cuba. “I would discuss with the pope the need to stop police violence against those who exercise their freedom to demonstrate in public,” Soler said. Cuba’s government considers the dissidents to be provocateurs who are financed by anti-communist groups in the U.S. as part of an effort to destabilize the government in Havana. 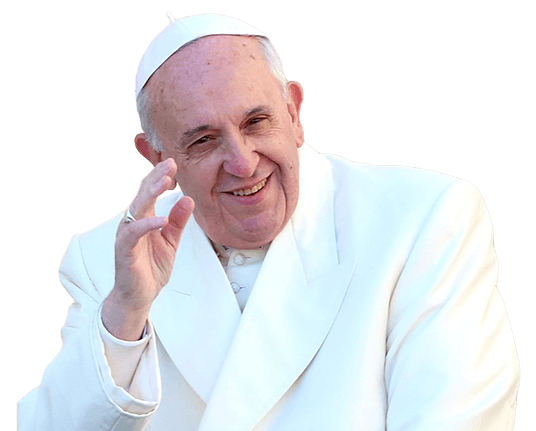 Ahmed & Robles, Cuba to Release 3,522 Prisoners Before Pope Francis’ Visit, N.Y. Times (Sept. 11, 2015); Miroff, Cuba pardons more than 3,500 prisoners ahead of Pope Francis visit, Wash. Post (Sept. 11, 2015); Council of State agrees to pardon 3,522 prisoners, Granma (Sept. 11, 2015). Reuters, Cuba Detains Dissidents Ahead of Pope Francis Visit, N.Y. Times (Sept. 13, 2015). 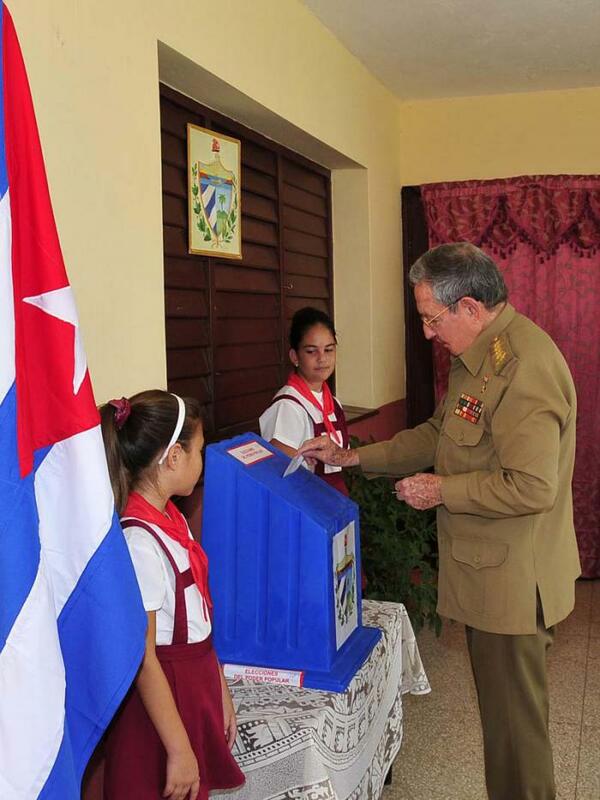 Eligible voters, under article 132 of the Cuban Constitution, are all Cuban men and women, 16 years of age and older, unless ruled ineligible in accordance with electoral law. 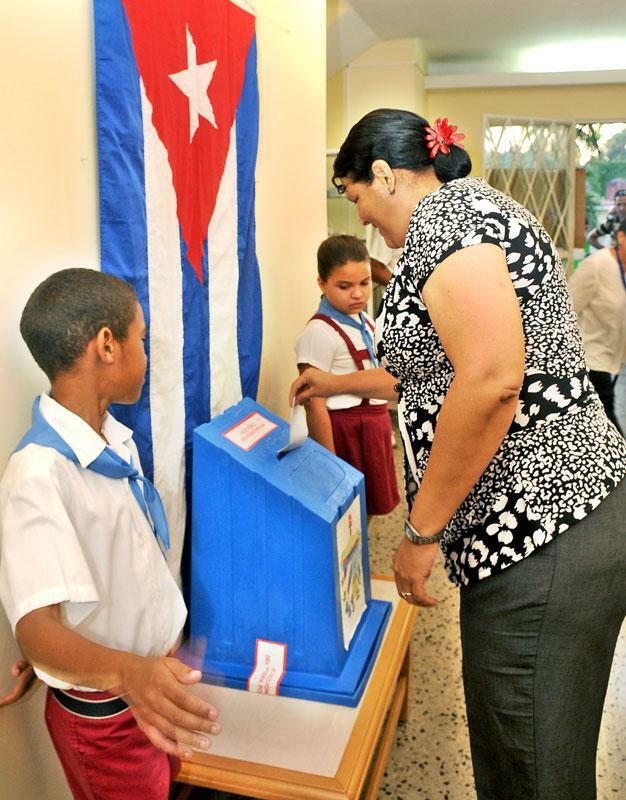 Voting in Cuba is a right and a civic duty, but is not a legal obligation. 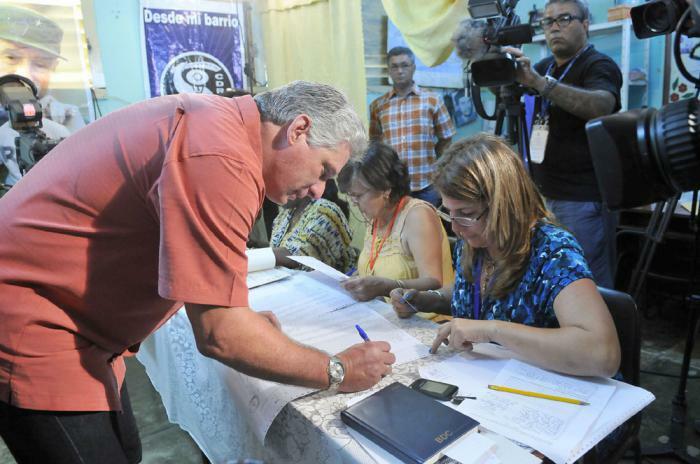 Voting is secret and the public can witness the count under Cuban law. Elected were 11,425 delegates to the municipal councils while 1,164 districts where no candidate received at least 50% of the vote will go to a second round of voting on April 26th. Of those elected, 34.87% are women and 14.95% are youth. Of the elected delegates, 59.24% are members of the Communist Party of Cuba, which shows that it is not obligatory to be a party member in order to be elected. Of the 27,379 candidates competing for 12,589 positions, two were Cuban dissidents who failed to become the first openly declared political opponents to win election in Cuba since the 1959 revolution, each failing in races for Havana municipal assemblies. In response to these two candidacies, Cuban media and electoral officials published disparaging information about the two men, including in the official candidate biographies hung by the government around their electoral districts. Articles in Granma featured photographs of Cuban leaders voting: Fidel Castro, Raúl Castro and Miguel Díaz-Canel Bermúdez, the First Vice President and the reputed presidential successor to Raúl Castro. The date of the election, April 19, was chosen because it is the date when Cuba defeated the U.S.-sponsored invasion at the Bay of Pigs. This is this blogger’s first examination of a Cuban election. It is based almost exclusively on Cuban sources. Do those sources provide fair reporting of the election? Was it a fair election? Those are questions to ponder as the hoped-for U.S.-Cuban reconciliation goes forward. 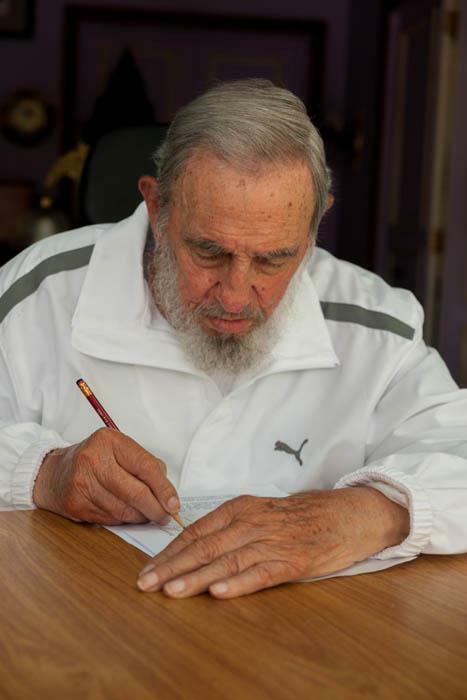 This post is based upon Loforte, More than 7 million Cubans exercised their right to vote, Granma (April 20, 2015); Hernández, Raúl casts his vote, Granma, April 20, 2015); Loforte, Fidel exercises his right to vote, Granma (April 19, 2015); Election day in Cuba, Granma (April 19, 2015); Castellanos, Voting is a tribute to our history, Granma (April 19, 2015); Hernández, Elections during historic times, Granma (April 19, 2015); Reuters, Two Cubans Lose Bids to Become First Opponents Elected to Office, N.Y. Times (April 19, 2015); Assoc. Press, 2 Cuban Dissidents Up for Election in Unprecedented Vote, N.Y. times (April 18, 2015); Mendoza & Medina, The right to vote in the Cuban electoral rules (final) (+inforgraphic), Granma (April 16, 2015).